With the horrifying details of past cruelties and crimes in the Mother and Baby homes run by the Bon Secour nuns, among other orders, coming out in Ireland now, it’s only a matter of time before they may be shamed and forced to change the name of this new private hospital. But would the ethos behind it ever get changed? An excellent blog. 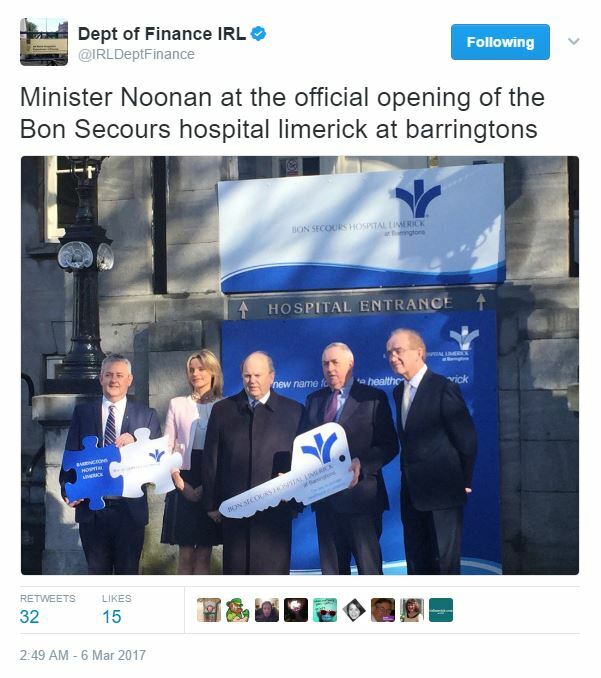 Today, Michael Noonan (more about him here) attended the opening of a private hospital facility in Limerick. Noonan is a former Minister for Health, and is the current Minister for Finance. The official Twitter account of the Department of Finance posted a photo of the Minister at the opening. Among other things, this shows how it is official government policy to promote the continued privatisation of health care. Noonan is hardly the first minister from the Fine Gael government to endorse the opening of private health care facilities. The Taoiseach Enda Kenny, and Leo Varadkar when he was Minister for Health have both done so, and for all I know, the current Minister, Simon Harris, may well have done the same.